benefits of keeping the Chamkharchhu river system free flowing? On the outset, let me be categorical that my petition to leave the Chamkhar Chhu undammed and free-flowing is NOT against the Chamkhar Chhu Hydro-power Project. 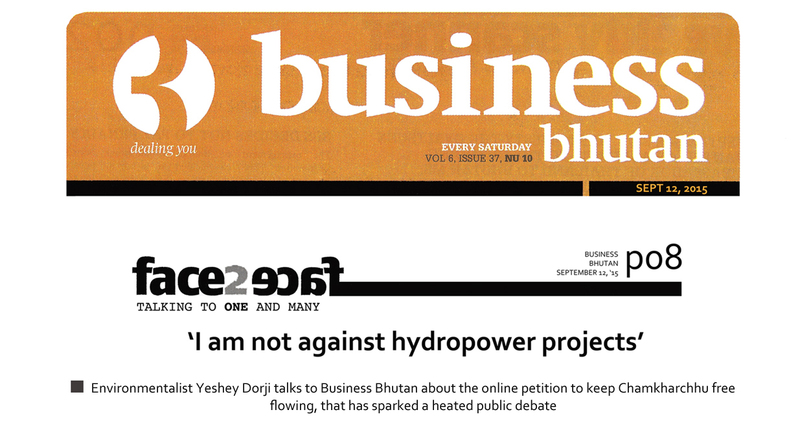 Further, I would also like to clarify that unlike what some would like others to believe, I am NOT against hydro-power projects. I am all for it, because it is correct that we must benefit from the substantial hydro-power potential that our river systems represent. Certainly, if planned and executed with foresight and the required degree of prudence, the hydro-power projects have the potential to be a game changer for us. However, beyond that, I am against every single aspect of the manner in which they are implementing our hydroy-power projects. > The opacity in the manner in which they conduct their business is wrong. a. First, in a situation where global warming is creating all sorts of fresh water scarcity, we cannot be so irresponsible as to dam every one of our rivers. All around the world, water is now recognized as the most valuable resource – even more than oil. This means that every passing year, our fresh waters will be more and more valuable - because other country’s fresh water reserves are on the decrease. Completely bewitched by the myth that hydropower will pave our roads in gold and that we will see untold riches as a result of it, the Bhutanese people have been lulled into a stupor, thereby robbing us of the need to be imaginative. Today the situation is so scary that should our hydropower fail us, we will be completely sunk! WE HAVE ABSOLUTELY NO ALTERNATIVES. We have put all our dreams in the hydropower basket. We need alternatives and I believe that over time, our fresh water reserve has the potential to be one of the alternatives that we have to begin to pursue. That opportunity we must bequeath to our future generations. b. Second, the Bhutanese subjects are going helter-skelter trying to do something meaningful to honor our IVth Druk Gyalpo during His 60th Birth Anniversary. Gates are being constructed, avenues are being dug up to plant flowers in His honor; books and magazines are planned to be released on His Birth Anniversary; new songs are being composed, unique dances are being choreographed. But all these are short-lived and transient - to be forgotten within months after the celebrations. What we need to do is to do something that will be permanent and can be remembered till the end of eternity. That is the second reason why I am petitioning the government for the liberation of Chamkhar Chhu from dams so that we may bequeath it to the name of His Majesty the Fourth Druk Gyalpo. Such a gift would be everlasting, as it should be! 2. A lot of work and planning has already gone into Chamkharchhu hydro project. Perhaps, there is little chance that government would agree to kill the hydro project at this stage. In hindsight, don’t you think the petition has come a tad late? Why now? 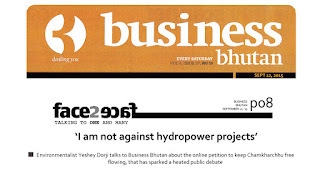 According to the Updated Bhutan Power System Plan 2004, as many as 76 hydropower projects are planned around the country. Therefore, one less hydropower project isn’t going to make any significant dent in their overall scheme of things. No substantial work has yet been done on the project – other than the DPR that is still a work in progress. Therefore abandoning the project will not translate into any significant loss of money. The petition is PERFECTLY TIMED - because there is no worthier cause for the petition, than that the river be spared in the name of a conservationist of unparalleled credential, and for the fulfillment of the inter-generational responsibility that is a Constitutional mandate of every Bhutanese. 3. The Chamkharchhu issue has in a way triggered another development versus conservation debate. savior that will uplift the quality of life in Kheng. What’s your view on this? That is wrong. It is not conservation versus development debate. I have said this already and I am saying it again - when you have a gaping hole in your tummy, environment isn’t going to fill it. I believe that under normal conditions, the cause of the environment cannot be the stumbling block for human development and progress. I am realistic enough to understand that conservation efforts will always play second fiddle to human greed and the modern economic order. It is lame to say that Zhemgang Dzongkhag got left behind because no hydropower projects happened there. It got left behind because the government did not do enough; it suffered poverty and neglect because elected leaders did not deliver on their promises. You don't need a hydropower project to bring roads, schools, hospitals and electricity to the villages. Hydropower project is not a prerequisite to the provision of these basic services. If those have not been provided, it is a failure on the part of the government and the apathy of the elected leaders. Look at Chhukha Dzongkhag, Punakha, Wangdue and Trongsa Dzongkhags. How have the villages benefited? How have the business community benefitted? I am amazed at the naivety of these people who claim that hydro-power projects will bring all sorts of development to the villages, even while facts stare them in their faces. White Bellied Heron, including the impact of Shingkhar-Gorgan road construction on tiger habitat. principles and policies that influence and inspire our development process? Yes, the government failed miserably! To some extent I can empathize with the environmental disaster at the Puna I & II – I can believe that the government would have never imagined that it would go so horribly wrong. Unfortunately we have not yet seen the end of it. However, what irks me is their unwillingness to learn their lessons from these tragic mistakes. Despite the monumental losses of money and opportunity, the government is still in a huge rush to do more projects. Why can’t we wait for the projects in the pipeline to be finished and commissioned? The issue of Shingkhar-Gorgan highway is something else. This one is the absolute height of irresponsibility and disregard for the country’s laws. The NEC and the WCD has been categorical that they will not issue the environmental clearance to do this road because the law in place prohibits it. The road makes no economic sense to any body. If this government goes ahead with this road, it will be a government that breaks laws. You can imagine the state of this country - when lawmakers turn lawbreakers. This one went well...best f luck...i m sold on your idea...keep us updated with whatever comes up next.